I've written about Simon Sinek on this blog before, and if you've read those posts, you know that he is my hero. He's an author best known for popularizing the concept of "the golden circle" and to "Start With Why," described by TED as "a simple but powerful model for inspirational leadership. 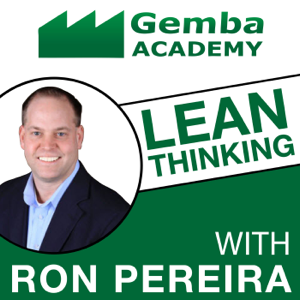 Last week Mark Graban sent me a preview from the Gemba Academy podcast announcing that they'd be interviewing Sinek in an upcoming episode. I kid you not, I spent the entire day Thursday periodically refreshing my podcast app waiting for it. I expected an interview with Sinek covering the same topics that he usually talks about - leadership, coaching, inspiration, and the like. Imagine my surprise, then, when Ron Pereira (the host of the show) mentioned Lean, which Sinek turned out to be surprisingly knowledgeable about. "Americans turned [Lean] into a tool for efficiency, and that’s never what it was supposed to be. There are zero, zero examples of an American company successfully implementing Lean when they do it as a tool for efficiency. Zero. How good can a process be if there are zero examples of success? It’s about cooperation, not efficiency. Efficiency may come out of the cooperation, as will profit and innovation, but the motivation is human. It’s not a metric." Sinek goes on to talk about everything from the differences between American and Japanese culture, why he wishes we'd never started using the term "Lean," and how true Lean has nothing to do with efficiency, and everything to do with people. Listen to episode 76 of the Gemba Academy podcast "The Courage to Lead with Simon Sinek" to hear the full interview. And to our friends at Gemba Academy - thank you so much for sharing this gem with us.